In an increasingly complex and globalized world, the arts have an important role to play in challenging unjust structures and policies, breaking down divisions between people, increasing our understanding of multiple perspectives and creating shared narratives. Drawing from her experience as an arts and peacebuilding practitioner, Amy Rebecca Marsico will discuss how theater can be used as a powerful tool to create space for dialogue, transform conflict and advocate for peace, human rights, and justice. 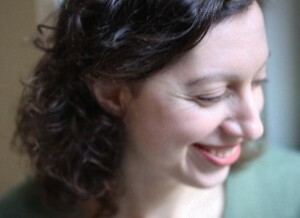 Amy Rebecca Marsico is an arts and peacebuilding practitioner. She has worked as a stage manager, producer, assistant director and writer in both non-profit and commercial theater. As a trainer and facilitator, she has designed workshops for youth that employ the arts to teach trauma awareness skills, encourage resilience, address root causes of conflict, and build capacity through dialogue and education. She has also designed workshops for women and girls that explore gender and power issues. Amy is the co-author of Transforming Trauma: An Interactive Role Play for Community Leaders and Caregivers – a piece that was used by the STAR program (Strategies for Trauma Awareness and Resilience) to train civil society leaders on how to recognize and address trauma in the aftermath of a terrorist attack. She wrote and compiled an Arts Resource Guide on the Israeli-Palestinian conflict for the US Campaign to End the Israeli Occupation. Amy is currently working on a play based on interviews with Arab-Americans on identity, trauma and human security. Amy has been a guest lecturer at Eastern Mennonite University, Bridgewater University, James Madison University and John Jay College of Criminal Justice. She holds a master’s degree in Conflict Transformation and Peacebuilding from Eastern Mennonite University.